Did Andrey Ternovskiy Sell ChatRoulette.com? This morning I discovered some interesting domain name registrations that are pointing in the direction that the once very popular website ChatRoulette.com may have been sold? First, this morning I discovered several new domain registrations and it’s “where” these registrations took place that makes me think there is something up and it may include a sale. The domain name FreeGames.com has been purchased by gaming site provider Flora ICT as announced in this TalkArcades.com forum posting from 7/25/2014. Based on whois records, it appears the transaction likely closed and ownership of the domain name took place on 7/1/2014. Paul Keever was the seller according to whois records. Paul appears to have owned the domain for sometime. Chain.com domain has been purchased for an undisclosed amount by block chain start-up Chain.com Inc. and sold by SOJCOM, LLC according to whois records. Based on some research, the company behind the Chain.com domain purchase is Albumatic who later changed its name to Koa.la but still is using the name Albumatic as they did in whois data for Chain.com . They were founded in 2012 and in 2013 had raised a Series A round of $4.2 Million. Did Google Buy Glass Opposers Border Stylo? I ran into something interesting this morning while digging around. 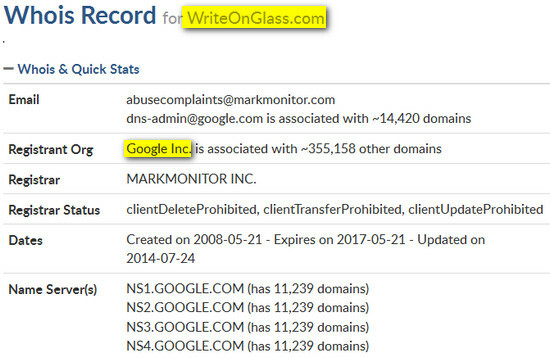 According to whois records, Google Inc. has just taken ownership of the domain name WriteOnGlass.com . Big deal right? Well, the past owner of the domain name is where things get interesting. Border Stylo, LLC owned the domain name and they also are the company that opposed Google’s trademark filing for “glass” back in April 2014.